It’s been a busy week in space, including the unveiling of the image of a black hole in the galaxy M87. But despite the triumphs, there was a twinge of sadness. On Thursday, the Israeli spacecraft Beresheet attempted to land on the moon—only to lose control in the last few kilometers above the surface. Umair Irfan, staff writer at Vox, joins Ira to talk about the moon landing effort and other stories from the week in science in this week’s News Roundup, including the rise of seasonal allergies in the age of climate change, a drug-resistant fungus plaguing hospitals, rising insulin prices, and the scientific value of poop left on the moon. See the very first image of a black hole. Learn more about the Beresheet mission at The Verge. IRA FLATOW: This is Science Friday. I’m Ira Flatow. A bit later in the hour we’re going to be talking about the big space news, that black hole, actually. Did you see that? Wasn’t that an amazing, amazing photo? If you have questions, if you have questions you’d like to ask the experts, well, you can if you make the call. Our number, 844-724-8255 or tweet us @SciFri. We’ll get to that right after our news roundup. And it has been a busy week in space, including the unveiling of that historic image, Last night’s launch of SpaceX Falcon Heavy rocket, and an attempted moon landing by the Israeli spacecraft, Beresheet. The spacecraft failed in the final minutes and probably crash landed– that’s what they think– on the surface of the moon. Joining me now to talk about that and other selected short stories in science is Umair Irfan, staff writer for Vox. Welcome to Science Friday. Welcome back. IRA FLATOW: Let’s talk about this. Let’s look at the moon landing attempt. What was it? Who was behind it? What happened to it? 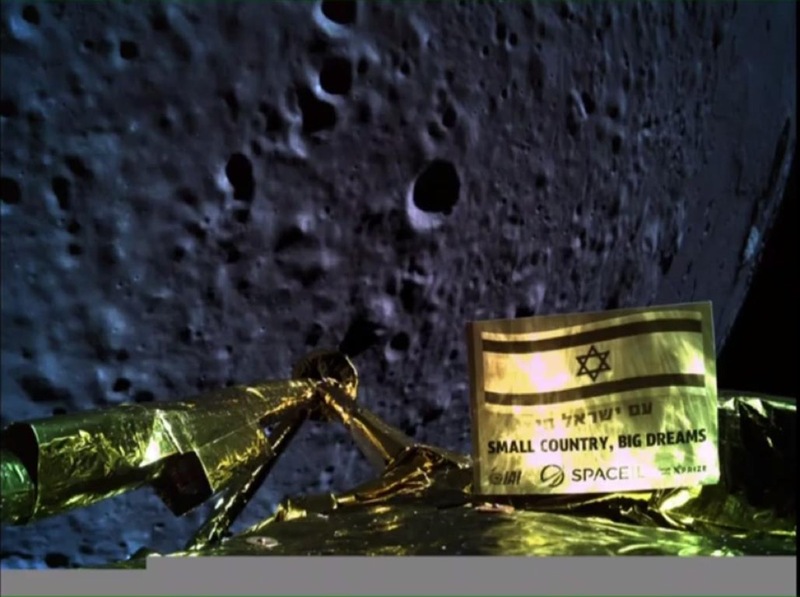 UMAIR IRFAN: Well, it was done by an Israeli nonprofit called SpaceIL. And what was particularly significant about it was that this mission was one of the first privately financed missions to the moon. This cost about $100 million. It was launched aboard a SpaceX rocket, and it was carrying some instruments to measure the moon’s magnetic field. But, of course, yesterday as you mentioned they lost contact on its way down, and the mission controllers presumed that the spacecraft has crashed. IRA FLATOW: So we don’t know– yeah. We don’t know why it probably crashed? UMAIR IRFAN: It’s a little early to tell right now. IRA FLATOW: Well, moving on. You have another story in Vox, a moon-related story about human waste. UMAIR IRFAN: Yeah, that’s right. My colleague at Vox, Brian Resnick, did a pretty thorough investigation of what the Apollo astronauts left behind. Now, they took a lot of stuff to the moon, and they took a lot of stuff back. But what in particular was interesting was these 96 jet bags, or bags that were jettisoned, and in them were human waste, including feces. Now that’s actually of particular interest to a small group of scientists, because human feces contain– are about 50% by weight bacteria. And it could give us some important lessons about what we can expect when it comes to living in space and about life on other planets. IRA FLATOW: So we could understand more about the survivability of microorganisms? UMAIR IRFAN: Yeah. That’s right. I mean, on earth we find microorganisms at the bottom of the ocean in thermal vents. We find them in glaciers. And past NASA missions have tested that bacteria can survive outside of spacecraft. Now it’s been 50 years since the Apollo missions, and the moon is a very harsh and desolate place. So it’s very unlikely that something has survived, but if something had survived it could have a pretty interesting mutation, or could have gone dormant. And there are some lessons we could learn for a longer term space mission, say a manned mission to Mars. UMAIR IRFAN: Potentially, maybe for a future Lunar Colony. IRA FLATOW: OK. So what do what is the possibility that someone will actually retrieve these and bring them back? UMAIR IRFAN: Well, it’s very low. I mean, the likelihood of another manned mission to the moon is still pretty far-fetched right now just because of the financing. But it is a priority for future missions. They do want to know about how life can survive in the farther reaches of the universe. And this is a really good inadvertent scientific experiment that they’ve set up for themselves. IRA FLATOW: It’d be interesting to see what’s going on there. Back on Earth a little closer to home there is another kind of microorganism in the news, and that’s a fungus among us. UMAIR IRFAN: –because it was just that hard to eradicate. IRA FLATOW: Wow. So where is it now found? Where is it spreading? UMAIR IRFAN: Well, right now it’s spreading in hospitals. Potentially anybody could get sick from it. But, of course, the people that are most vulnerable are the elderly, the very young, and also people who are already sick, which is why you find these kinds of drug-resistant infections in hospitals. And the big concern, though, is that hospitals aren’t necessarily required to tell the general public about it if there is an outbreak. The Centers for Disease Control, in fact, is not allowed to disclose which hospitals have reported infections. And they say it’s because they don’t want to start a panic, and they also don’t want people to get treatment if they think they have this– are showing symptoms. But it is alarming for the general public that there could be some of these spreading infections and they may not know about them. IRA FLATOW: I wonder if you call up and ask a hospital where you’re having elective surgery this week or next or whatever– hey, got any cases of that fungus around there– whether they will tell you anything. UMAIR IRFAN: Well, that’s been a big concern. I mean, there were patients who were reported to be ill or may have been infected with these drug resistant bacteria or fungi, and they were– some people have alleged that they were mistreated or they were given substandard care because the hospital staff was too afraid to interact with them. And so that’s also another concern. IRA FLATOW: All right. Let’s move on there’s something a little more pleasing to talk about. The spring, spring flowers– they’re blooming and some people, the bad part, are really feeling their allergies. And there is a climate connection this time, is there not? UMAIR IRFAN: Yeah. There’s actually been a growing climate connection, and new and more research keeps coming out showing the links. There was a recent paper in The Lancet Planetary Health that showed that in about a dozen different sites all over the world they found that the amount of pollen and the duration of pollen being produced by some plants has been increasing as temperatures have gone up. You may have seen some images this year of giant yellow clouds floating over North Carolina of pollen, and it’s a trend that we’re likely to see getting worse in the coming years. IRA FLATOW: And it’s becoming more severe not just because of warmer weather, but what? The CO2 levels are making plants produce more pollen? UMAIR IRFAN: Yeah. That’s right. The warmer weather, of course, makes the growing season longer for plants. Warmer winters makes it so they bloom earlier in the year. But carbon dioxide is, of course, plant food, and what it does is it does encourage the plant to produce more pollen. It’s not just at a planetary scale. We see plants like ragweed near highways, for example. They grow and produce more pollen because they’re exposed to more CO2 from cars. So it’s a very small scale effect as well as a very large scale effect. IRA FLATOW: OK. Well, thank you very much for talking with us today, Umair. IRA FLATOW: Umair Irfan is a staff writer for Vox. Researchers are reviving ideas from the pre-antibiotic age to fight drug-resistant bacteria.